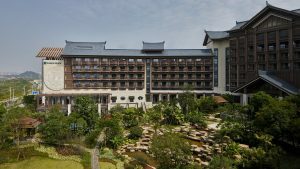 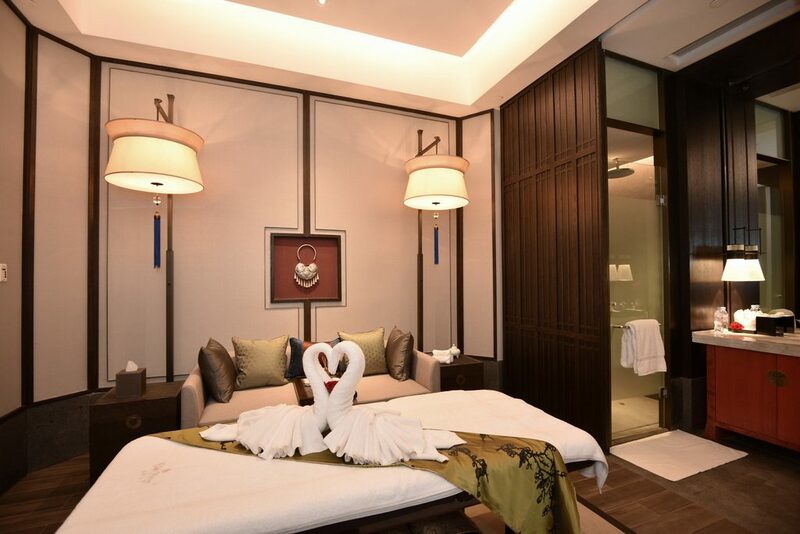 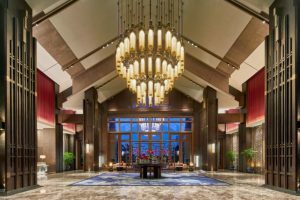 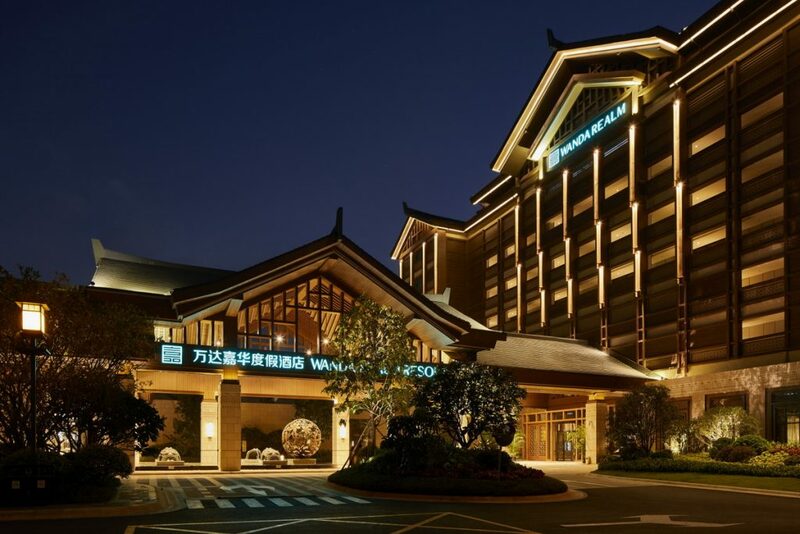 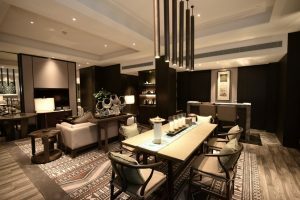 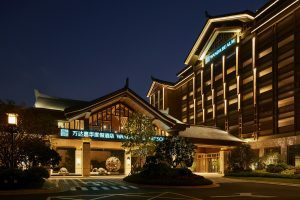 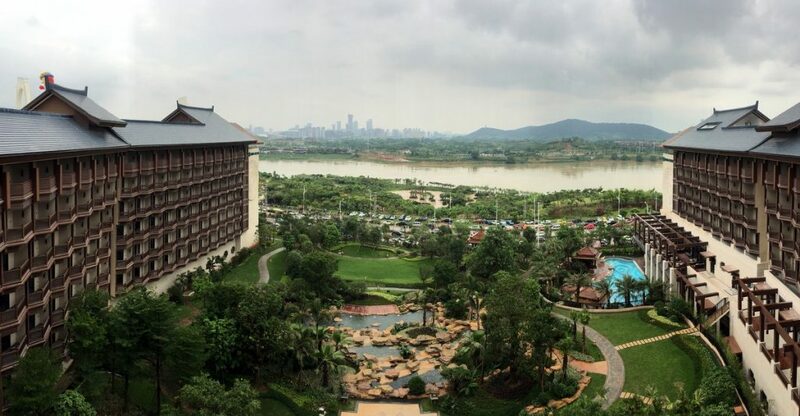 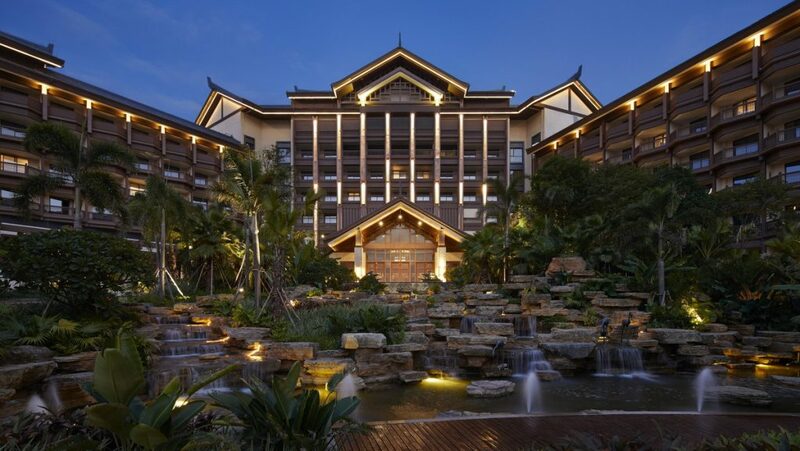 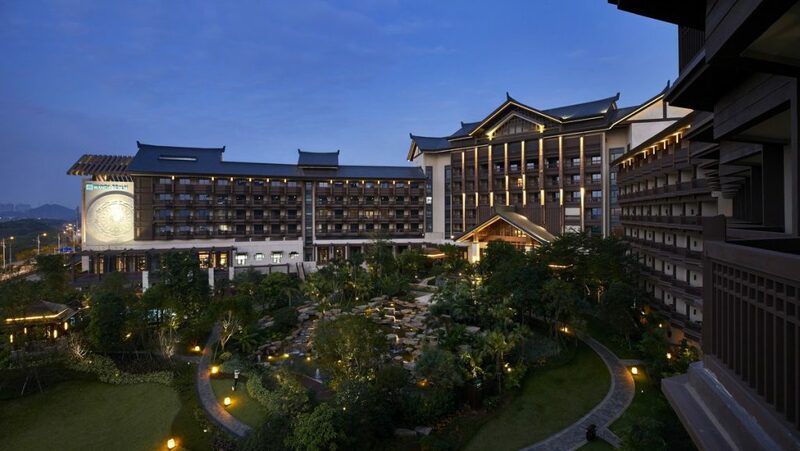 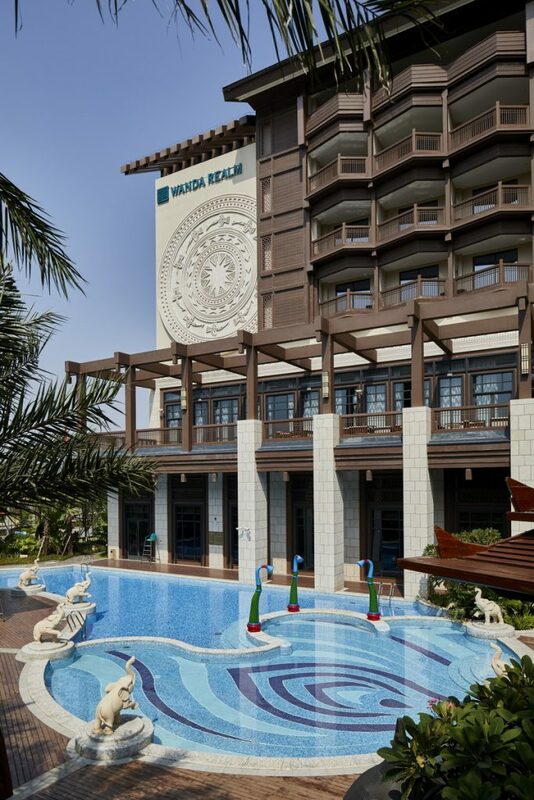 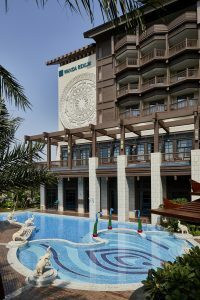 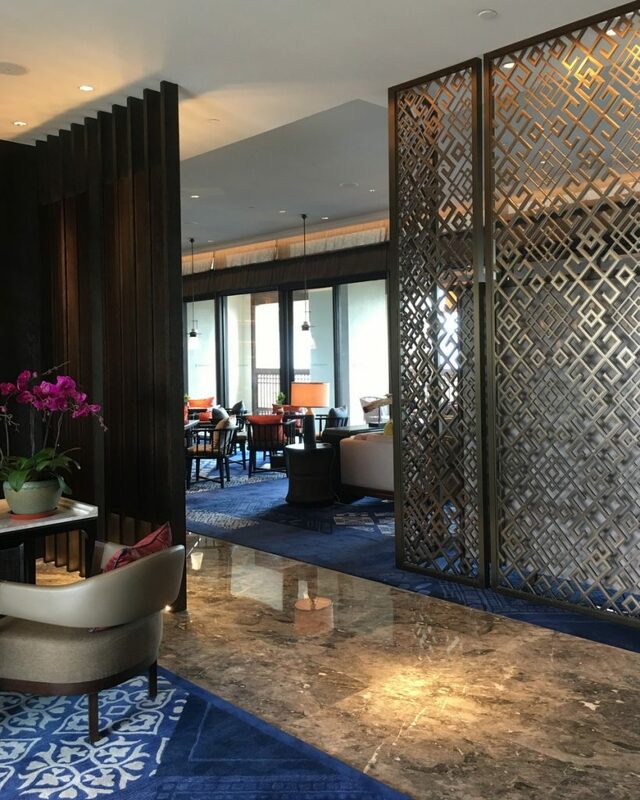 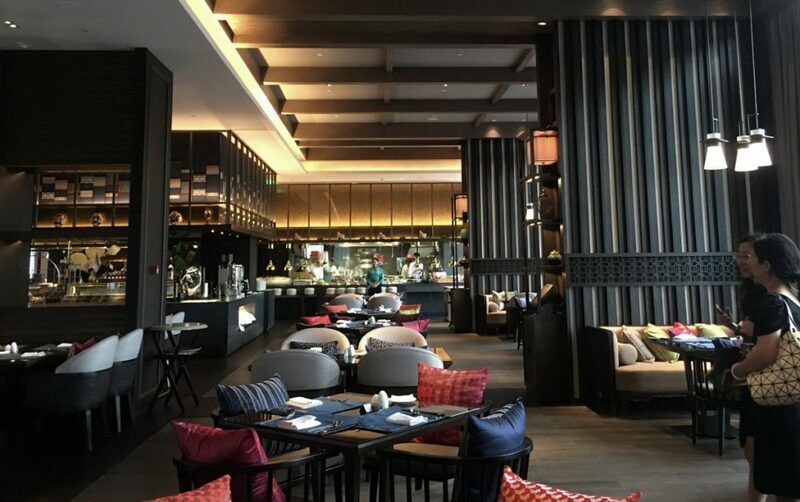 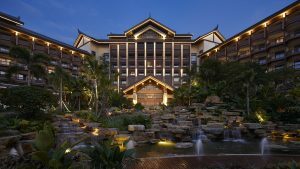 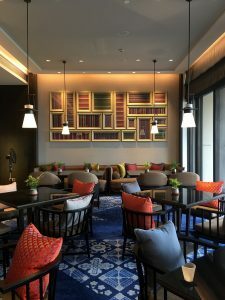 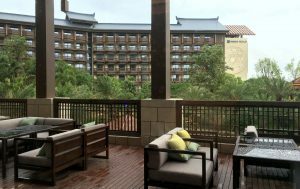 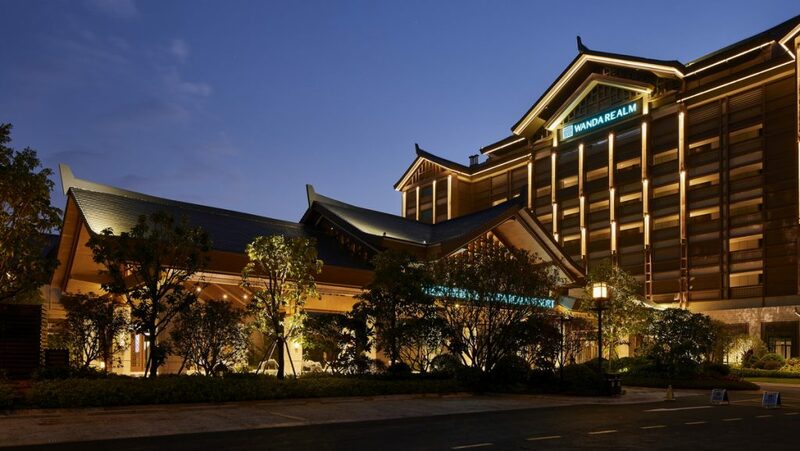 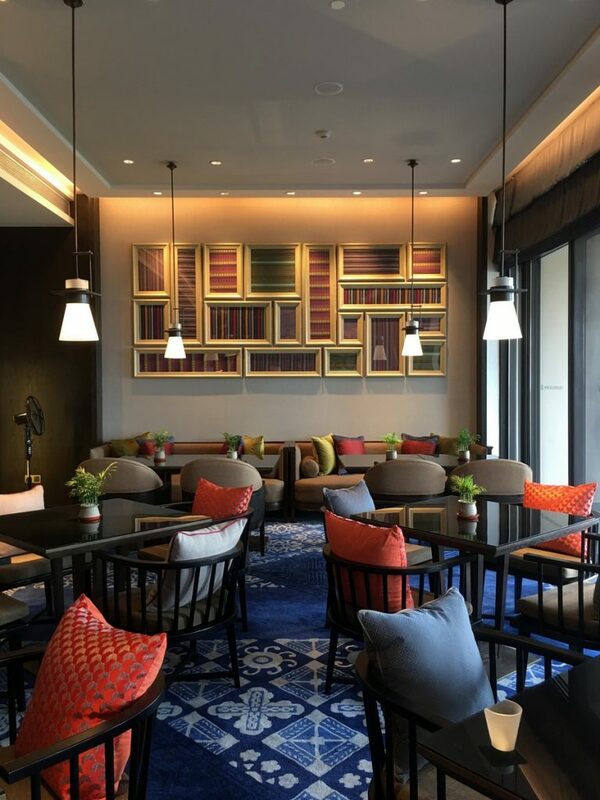 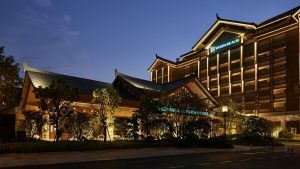 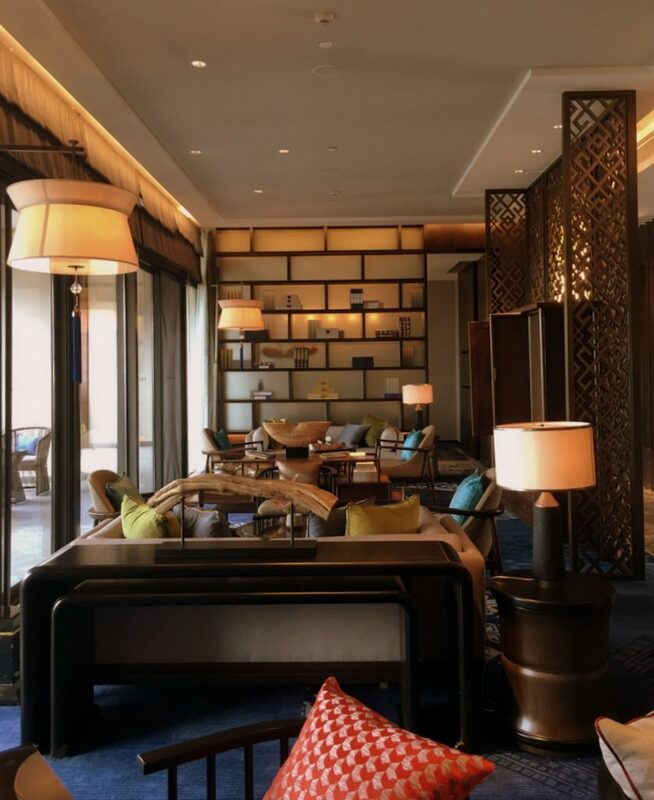 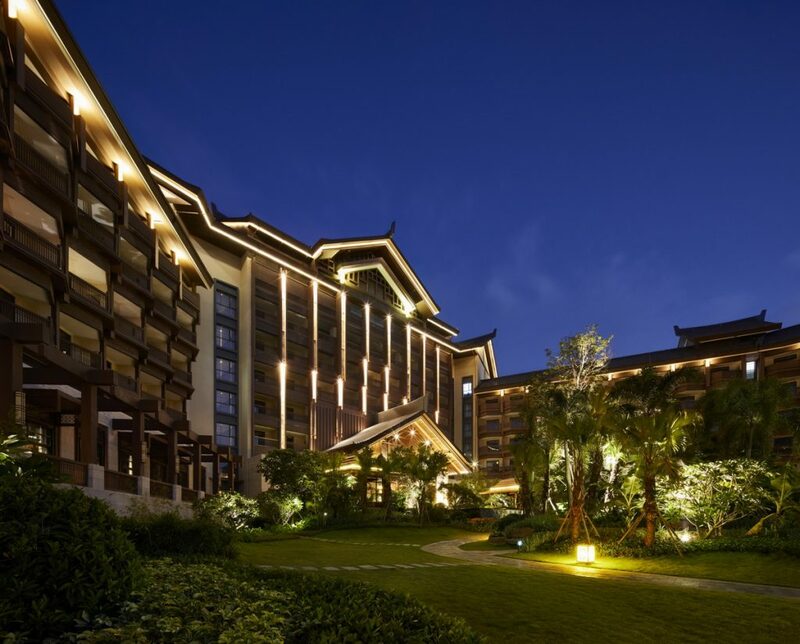 The Five Star Resort Hotel is located in the capital city of Guangxi Province, in the tropical south of China (less than 200km from the Vietnamese border) as part of the overall ‘Nanning Wanda Mall’. 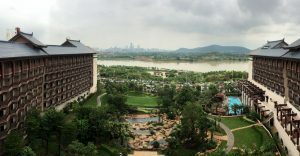 The major challenge for the master plan was to provide the best views of Yong River for guest rooms and public spaces of lobby and restaurants. This was achieved by placing the hotel building towards the river and banquet and conference halls towards the opposite (east) side. The U shaped layout of the main building allows the guest room wings to face the river landscape. 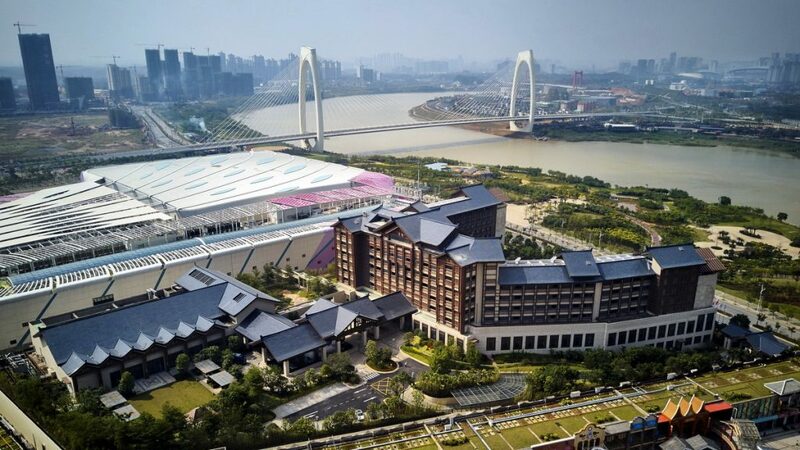 Nanning Wanda Mall Investment Co., Ltd.
Continue reading "Nanning Five Star Resort Hotel"
Additionally, the buildings were raised 8 meters so the entire public level has an adequate perspective view of the river and the landscaped private gardens of the hotel, also allowing for underground parking, service and back-of-house areas with at-level access to the service street. 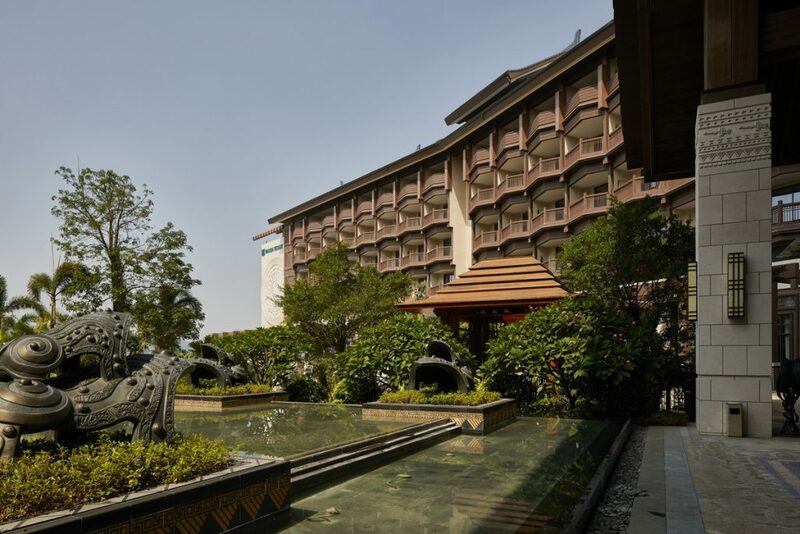 The conference and banquet halls have their own area with a private garden for events, and a shared entrance canopy. 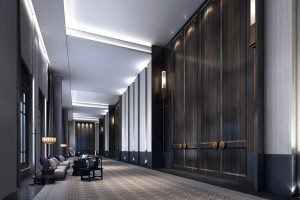 For the overall façade design, our ‘Zhuang Palace‘ proposal, with a unique approach to the local architecture of the Zhuang minority and a touch of rich detail treatment was chosen by Wanda from among more than four design options. 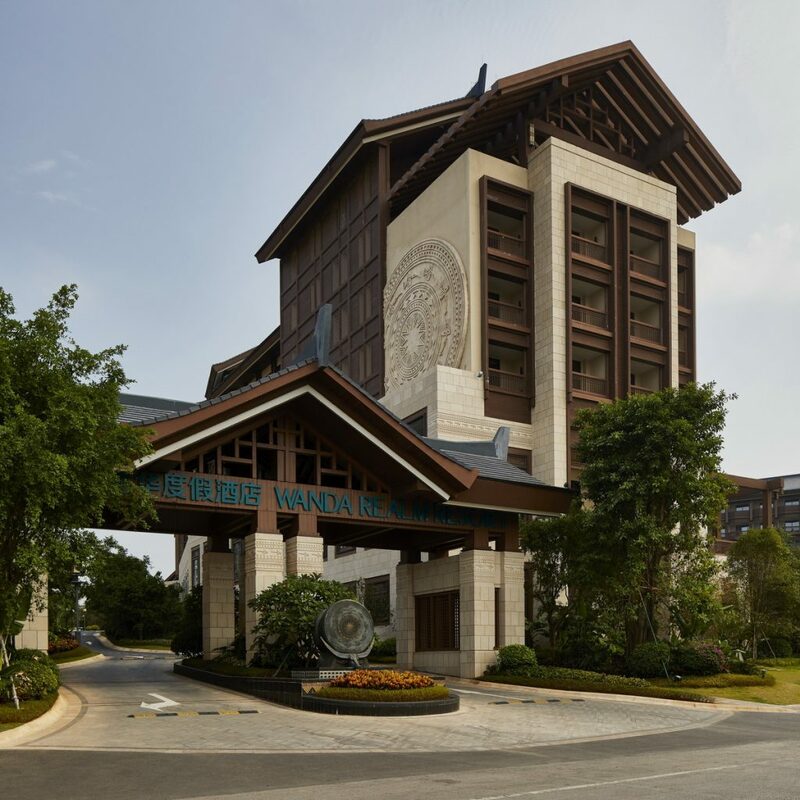 The hotel was to convey a sense of pertinence to its location, becoming an interpretation of the local architectural and cultural resources. 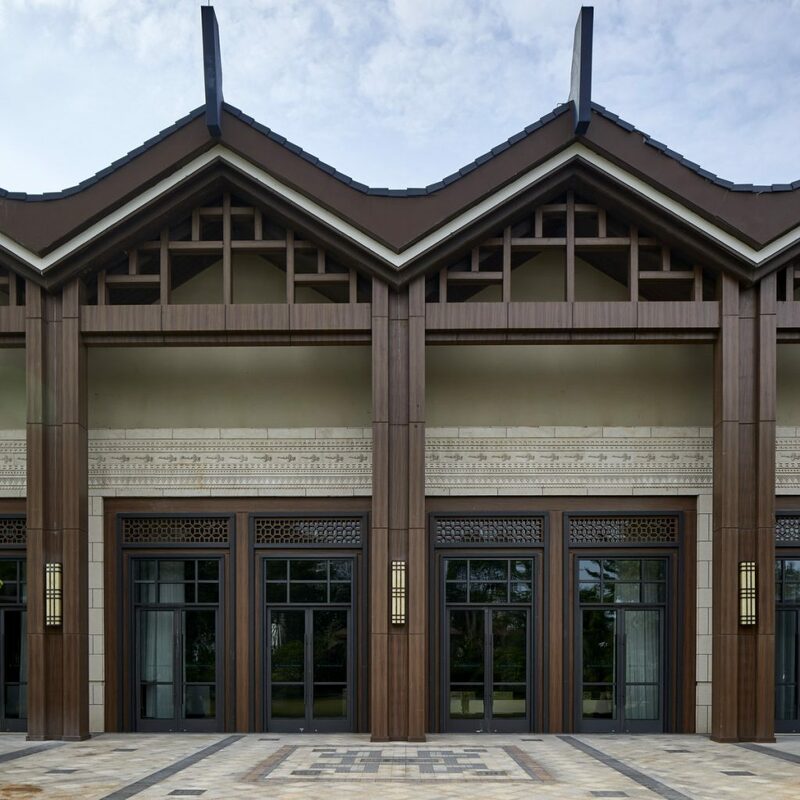 The research led to determine the Zhuang tradition as a rich source of inspiration both in its architectural features as well as some cultural traditions and artifacts. 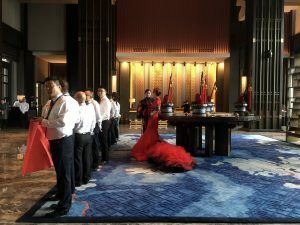 On the other hand, the function of the building and the sense of service provided by a hotel to its guests prompted us to search for a way to elevate the local tradition to the appearance of a palace. 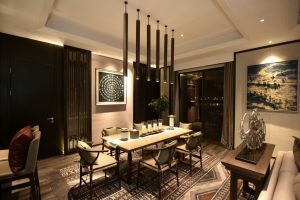 Therefore, the main concept was expressed as a Zhuang Palace, with a strong supporting base elevating local architecture and culture to elegance and refinement. 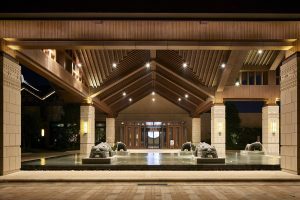 Typical architectural elements such as the distinctive stacked roof structures and consecutive roofs, overhanging balconies and the elaborate wooden paneling, fenestration and lattice work in facades, were the source for what we called the “noble wooden mantle”, expression of the served area, whereas the serving area was expressed as a solid stone base that supports the wooden elements. 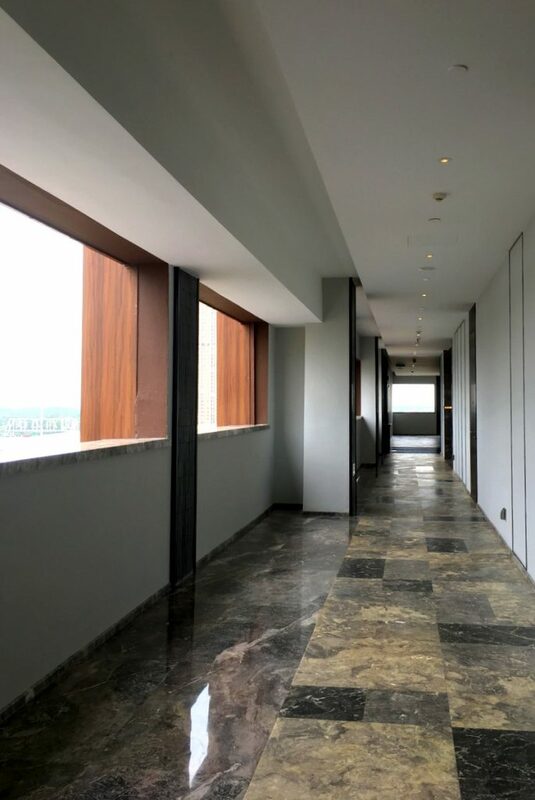 The light, delicate and noble wooden mantle that hangs from the roofs is mainly composed by the guestroom angled balconies to provide the best views of the river, corridors and the wooden paneling that articulates the facades. 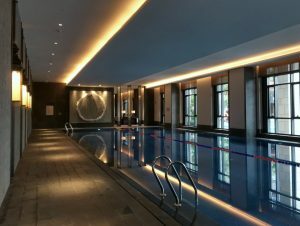 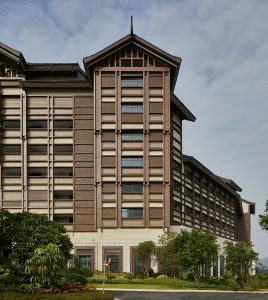 The stone-clad covered walls of the lower floors constitute a modern, elegant and solid base, containing the public functions and administrative areas of the hotel. This juxtaposition is the massing concept of the building, a perfect combination of heavy and light, solid and void. 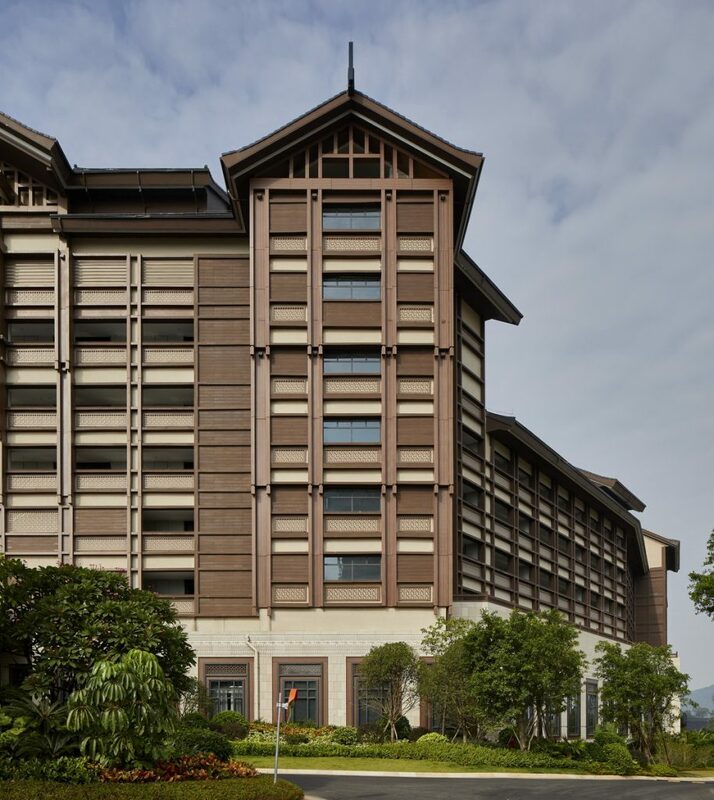 The roof design is an extension of the facade design and breaks the volume into parts that work together, with a clear central volume and end towers. 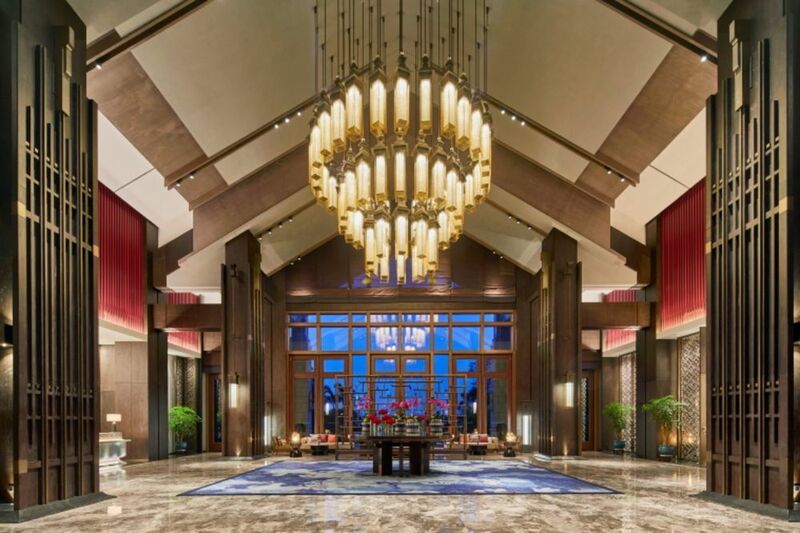 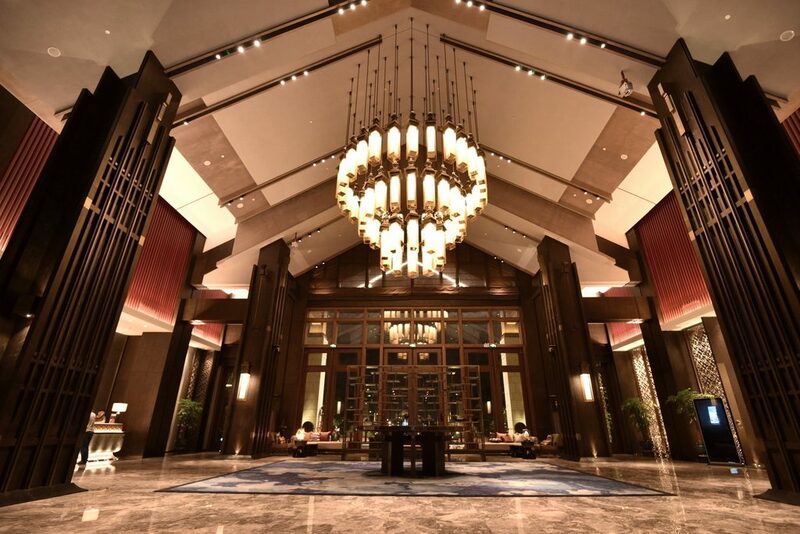 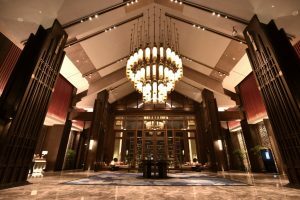 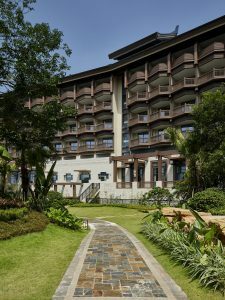 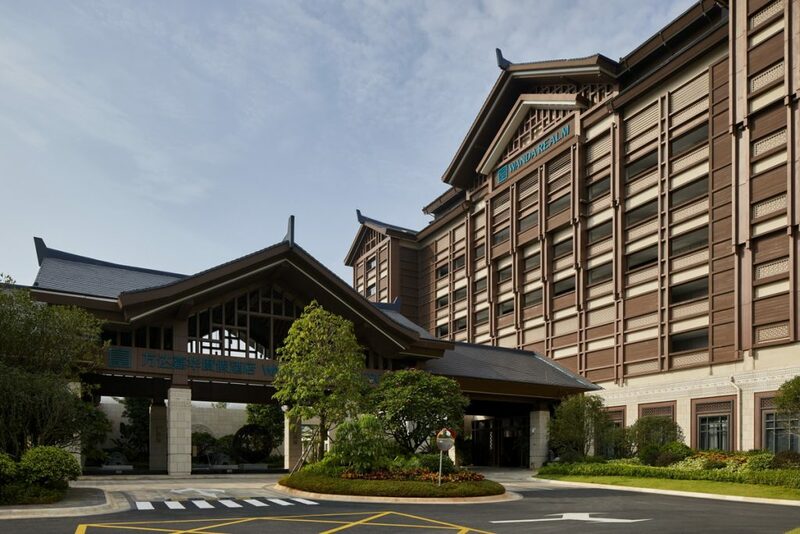 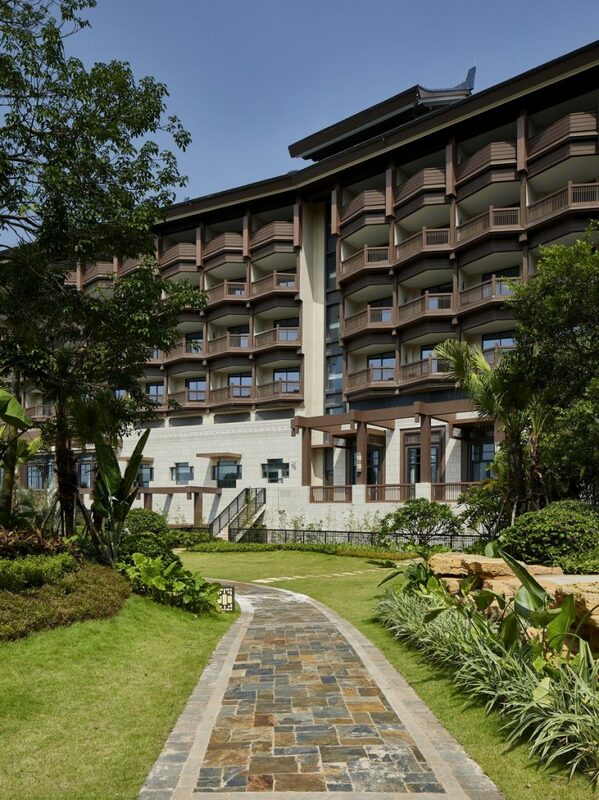 One single main entrance canopy, connecting the entrances of the hotel and the banquet hall, gives character with dimensions that express the high standard of the hotel. The hotel lobby is a flow-through transparent space, with a continuous axis from entrance canopy, main doors, lobby and exit to the garden terrace, bringing the landscape into the noble spaces in a relaxing atmosphere. 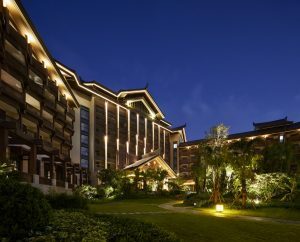 The end towers emphasize the vertical dimension in the vicinity of the access avenue while displaying the large traditional drum pattern as a branding motif for the resort. 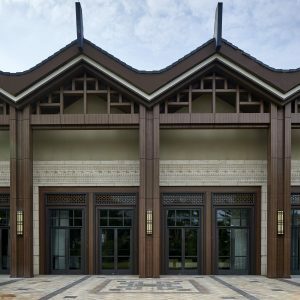 The design of the drums was taken from local culture and applied as a pattern for the large scale stone decorations on the facades and as a frieze that highlights the Piano Nobile of the building. 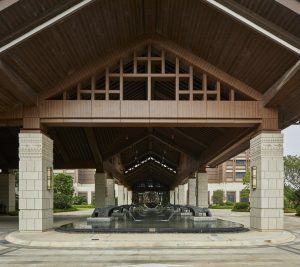 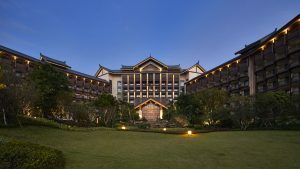 The main design features of the hotel, noble stone columns and a floating wooden roof, conform the welcoming street side gatehouse. 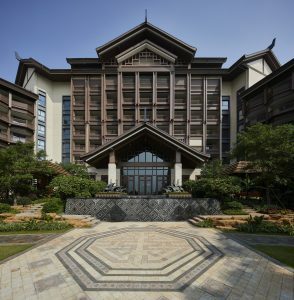 In addition, the main design motif of the banquet hall is the traditional repetitive roof, to highlight the importance of the building as seen from above from the neighboring high-rises.